Applied Materials has been on the rise since setting its low on Dec. 26, a key reversal days. 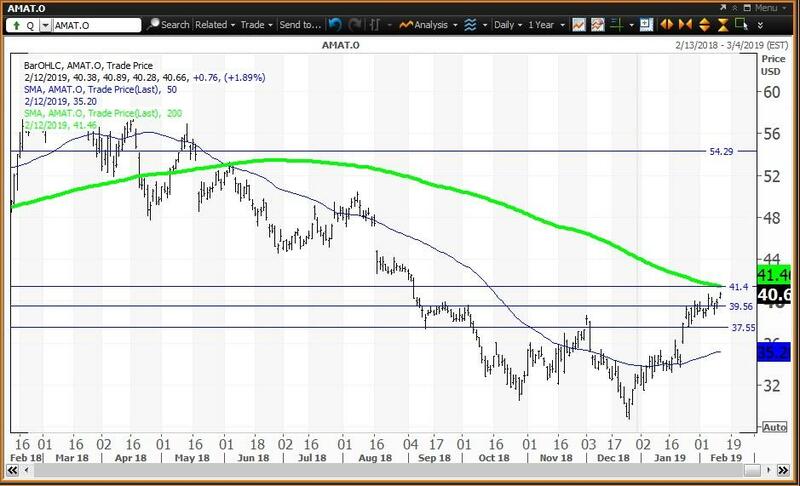 Applied Materials Inc. (AMAT - Get Report) has been on the rise since setting its low of $28.79 Dec. 26, which proved to be a "key reversal" day. Such days mark a tradeable rally, as the close of $30.64 on Dec. 26 was above the Dec. 24 high of $30.32. This defines the characteristics of a turnaround story. The stock closed Tuesday up 1.98% at $40.69. It closed Monday at $39.90, up 21.9% so far in 2019 and up by a bull market 38.6% since setting the Dec. 26 low. This turnaround story continues as the stock is still in bear market territory at 36.1% below its all-time intraday high of $62.40 set on March 12, 2018. Applied Materials reports quarterly results after the closing bell on Thursday, Feb. 14 and analysts expect the company to earn 79 cents to 81 cents a share. The stock has a favorable P/E ratio of 8.94 and offers a dividend yield of 2.01%, according to Macrotrends. Most Wall Street analysts expect a year-over-year decline in both earnings-per-share and revenue so the key will be forward guidance that must be upbeat to sustain the turnaround story shown on the daily and weekly charts. Applied Materials has been on a winning streak of 13 consecutive quarters of beating EPS estimates but since the stock peaked on March 12, 2018 it gapped lower following earnings released on May 17 and Aug. 16. The stock opened lower after its last earnings report released on Nov. 15, but then rebounded. At the end of January, Citigroup called AMAT its second-best pick in the semiconductor wafer fabrication industry. The daily chart for Applied Materials shows that the stock has been below a "death cross," since June 5, 2018, when the 50-day simple moving average fell below the 200-day simple moving average indicating that lower prices would follow. The stock could have been sold at $53.04 on that day. This bearish warning remained in play until the "key reversal" day on Dec. 26. The close of $32.74 on Dec. 31 was input to my proprietary analytics and three of the horizontal lines represent key levels. My annual value level is $37.57 with my semiannual pivot at $41.35 and quarterly risky level at $54.25. The Jan. 31 close of $39.08 resulted in my monthly value level, which is not in the chart at $28.68. My weekly pivot at $39.56 held at Monday's low of $39.33. 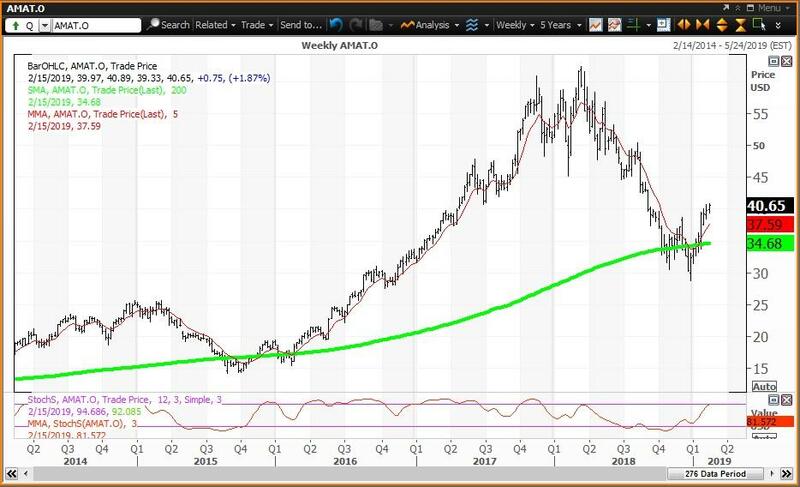 The weekly chart for Applied Materials has been positive since the week of Jan. 11 and the stock is now above its five-week modified moving average of $37.61 and is above its 200-week simple moving average or "reversion to the mean" at $34.68. The 12x3x3 weekly slow stochastic reading is projected to end this week at 81.64 up from 75.02 on Feb. 8. The projected reading of 81.64 is above the overbought threshold of 80.00 on a scale of 00.00 to 100.00. Trading Strategy: Buy weakness to my weekly and annual value levels at $39.56 and $37.57, respectively, and reduce holdings on strength to my semiannual risky level at $41.35, which lines up with the 200-day SMA at $41.46. Above is my quarterly risky level at $54.25.